On the 30th of August 205 Group "stood down" due to bad weather and no operations were carried out. On the night of August 31 - September 1, 1944 the Group carried out operations against the marshalling yards at Ferrara. Ferrara was an important rail center on the main northern route from the battle area and the object of the nights mission was to destroy rolling stock (between 300-400 rail cars were known to be in the yards), rail facilities, and to cut the tracks in the marshalling yards. Eight 37 Squadron Wellingtons were detailed and all attacked, dropping two 4000 pound bombs, forty eight 500 pound bombs, thirty five 250 pound bombs and 92,000 leaflets. Illumination, marking and bombing were up to three minutes late due to adverse winds on the inbound journey. Red target markers fell just east and west of the northern tip of the marshalling yards and bombing was well concentrated on the target. Opposition consisted of an intensive barrage from heavy caliber anti aircraft emplacements. Two aircraft were hit by flak. Wellington "K", captained by Sgt. Malcolm-Jones was hit in the port elevator and rear tire. "X", captained by F/Lt. Taylor suffered damage to the starboard wing, fuselage and clear vision panel. "P", captained by F/Sgt. Robson was hit by a falling bomb over the target, damaging the port wing. All aircraft returned safely to Tortorella. Two Wellingtons of 205 Group collided over the target but, amazingly, both returned to their airfields with only minor damage and no casualties. All aircraft took photos, seven plotting right on the target at correct headings. The Wing "best photo" was won by "R" piloted by F/O Ralph of 37 Squadron. While this attack inflicted severe damage, one through line remained serviceable and the marshalling yards at Ferrara continued to serve as an important railhead behind the Gothic Line. For this reason the Group was again detailed to attack the yards on the night of September 2/3, 1944. Eight 37 Squadron Wellingtons were detailed and operated. F/Sgt. MacIsaac took off from Tortorella at 2010 hours carrying eight 500 pound and six 250 pound bombs. ETA at Ferrara was just about two and one half hours. He was, as usual, flying Wellington "D" - LN798. At Ferrara crews reported a brilliant orange glow, intermittently dimming and brightening, to the west of the target area. Flak defenses were again in effect, however, no searchlights were observed. Illumination was well timed and well placed. Red target indicators were dropped close to the marshalling yards. Over Ferrara F/Sgt. MacIsaac lost the hydraulic system in his Wellington after being hit by flak. Despite the damage to his aircraft, he pressed home his attack, bombing on the red TI’s at 2253 hours from 8300 feet on a heading of 355 degrees. Several bursts in the marshalling yards were observed as a result. 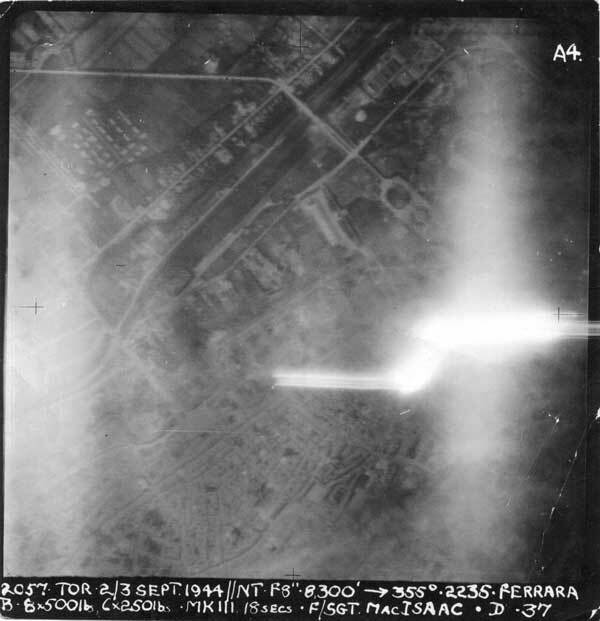 MacIsaacs aiming point photo over Ferrara of September 2/3 1944. The flak battery that was nearly his undoing can be seen firing near the center of the photo. The roundhouse of the marshalling yards is visible just to the upper right of center. Of the eight 37 Squadron Wellingtons detailed, seven attacked, dropping one 4000 pound bomb, forty seven 500 pound bombs, thirty eight 250 pound bombs and 78000 leaflets from 8000 to 8500 feet at 2230 to 2235 hours. Bombing was well concentrated. All seven attacking aircraft obtained photos showing bombing on or near target and on the correct headings. MacIsaac, his aircraft damaged and minus hydraulics, managed to return to Foggia and landed at the Tortorella airstrip safely - no small feat of airmanship. He touched down at 0045 hours. Ground crews immediately set about repairing the damage to Wellington "D" - MacIsaac & crew would fly her again. Wellington LN798 - "D" flown by F/Sgt. James MacIsaac. 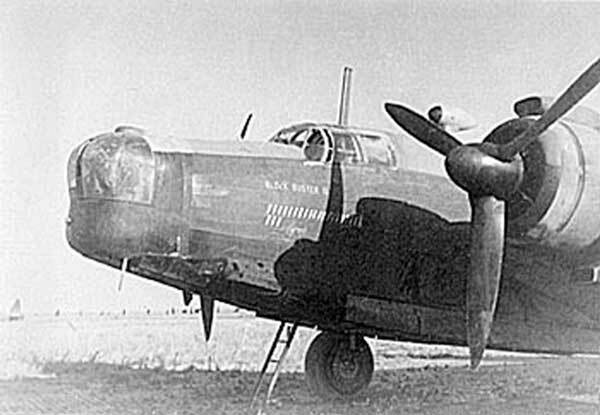 Painted under the cockpit is the name of the aircraft - "BLOCK BUSTER II" - along with a single bomb for each operation is has successfully completed. It was their 23rd operation. They have no known graves but are commemorated at the CWGC Malta Memorial. 205 Group lost two aircraft with the loss of all crew on this operation.